Atopic dermatitis in a child can sometimes get worse over time, but it is complicated and can be aggravated. Often, dermatitis disappears as the child grows, although some children still experience atopic dermatitis at an adult age. It is usually associated with elevated levels of immunoglobulin E (IgE). It is the first disease that has appeared in a series of allergic diseases - including food allergies, asthma, and allergic rhinitis. We do not know the exact cause of atopic dermatitis. Scientists know that dermatitis is the result of a combination of genetics and environmental factors. When something outside the body triggers an immune system, the skin cells do not behave as they should. 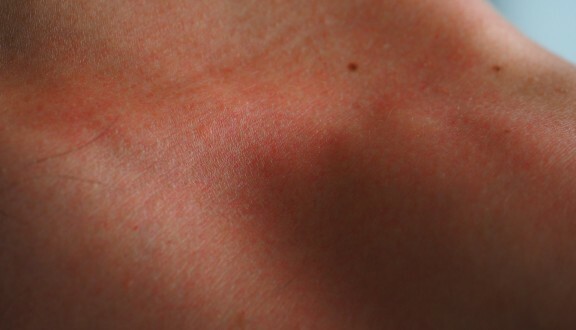 The skin begins to redden and it takes the form of inflammation. It is also known that atopic dermatitis occurs within the family, but there is no known how to relocate from the parent to the children. If one parent has AD, asthma or fever, there is a 50% chance that their child will have at least one of these diseases. If both parents have one or more of these diseases, chances are much bigger that their child will have problems too. Continuous skin itching is the only symptom of atopy. The disease usually has occasional bursts of intensity and return. If you often feel itching, it is recommended to avoid irritation of the affected parts of the body, as this only increases inflammation. OLILAB has developed an innovative formula of cream with its ingredients, with high concentrations of Ichthyol, to reduce redness and itchy skin symptoms. The action of Aloe Vera can help in preventing skin problems and accelerate wound healing process, while shea butter has great importance because it protects the skin from drying, restoring its moisture and softness. It is suitable for the care of all skin types, especially dry and mature. It has place is in cosmetic type "Dry Skin Care". Proper use of Ichthyol Plus Creams with Aloe Vera requires clean skin before application. In some skin cases, when it is very irritated, it is recommended to apply cream in a thin layer to first restore the damaged part of the skin, with a combination of cream with panthenol. Children over the age of 3 can also use the cream.